Is your brand attracting the right customers? Sapna Pieroux from InnerVisions ID explains how to build your brand using the DO-SAY-SEE © model. You’re looking for a certain product or service. You go to a company’s website or pick up a brochure. 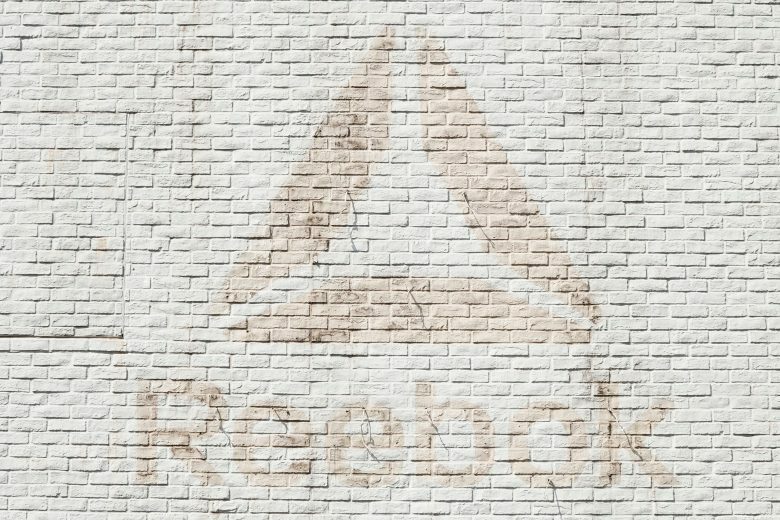 The logo is rubbish, the photography is cheesy, the styling is dated – and aaargh! Typos! In just a few seconds, you’ve made up your mind – to look elsewhere. Now consider your own brand: your logo, imagery, business cards, website, social media and brochures. When your potential clients find you online, is what they see helping you win business – or lose it? Many entrepreneurs don’t fully understand the power of good design in attracting the right customers. But worse, they don’t realise how bad – or no – design can actually lose them business. However, if you want to be seen as professional and charge your worth, you need to learn about, value and invest in your branding. I was asked to write a chapter for the Amazon #1 best-selling Fit For Purpose Leadership 2. Doing my research, I found very little that talked about branding for business leaders the way I approached it: aligning it with their business goals and visions. In my time, I’ve spoken with hundreds of entrepreneurs. I’ve seen a pattern in how they build their businesses. I’ve identified the big mistake so many make – and seen my methodology give them brand clarity, confidence and accelerated business growth. 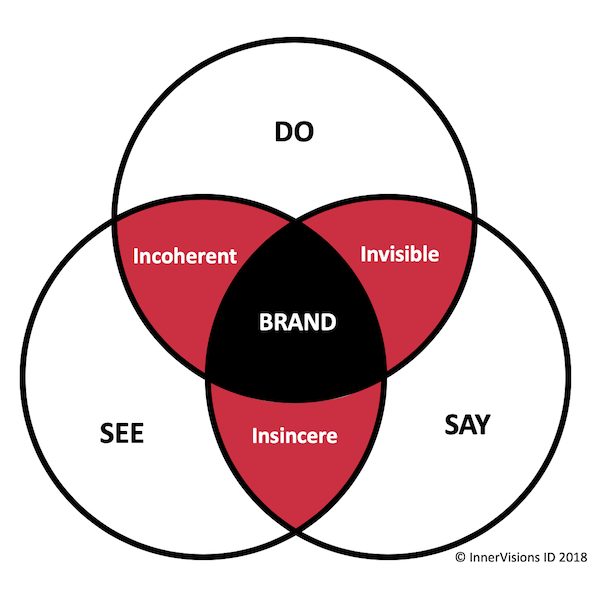 I created the InnerVisions ID DO-SAY-SEE © model to illustrate the three pillars needed in order to build your brand: what you DO for others, what you SAY to them and what they SEE. Here’s how it works. Next, entrepreneurs usually focus on how to communicate their business. SAY encompasses the written or spoken word. It is everything from your business name and strapline to your elevator pitch and the talks you give. It’s the copy in your website, brochure, social media, articles and books. You will work on honing this message by reading business books, investing in mentors, coaches or copywriters, checking out the competition or watching the pros. Your SEE is everything visual about your company. Time and time again, I see this third, crucial pillar not prioritised nor given equal attention and importance to the other two. Poor old SEE is often DIY’d, done on the cheap or briefed out last-minute, an afterthought. Yet SEE is often the first touchpoint for your potential clients. That’s your logo, the styling and ‘feel’ of your website, brochures and business cards, your photography, colours, typography, illustrations, patterns. It’s how you present yourself and the environment you conduct business in – Starbucks or a members’ club? (NB Branding will also affect your SAY, your brand voice and personality – another reason to not leave this till last! When your DO-SAY-SEE © elements all work to support each other, that’s when you can truly build an authentic brand that resonates with others. If your company looks great and promises you the world (SEE+SAY) but then fails to deliver, you have a business which is INSINCERE. It will disappoint, get bad reviews and you will lose business. If you have an excellent product or service and great image to match (DO+SEE) but you can’t articulate your value, then you will be INCOHERENT to your potential customers. They won’t clearly and easily understand what you do, they’ll seek help elsewhere, and again you’ll lose business. If you have a great DO+SAY, but then you hand over a scrappy business card or your website looks dated, you will turn off your clients in seconds. The #1 danger is that without SEE you become INVISIBLE and lose business to your more attractive-looking competitors. In my 24-year career, I have trained and worked not just as a graphic designer but in marketing and then in media sales, bringing national brands – such as Rimmel, Volkswagen and the Open University – to life in engaging, creative (and sometimes award-winning!) advertising campaigns. This experience means I understand my clients’ business challenges better and that gives me a unique perspective and approach to branding their businesses. I believe that if you brief any design that’s not aligned with your business goals and visions, you’ve basically commissioned a pretty picture. Branding is about your company ‘looking the part’, dressing it for the job you want. So what you SEE has to align with, support and strengthen what you SAY and DO. 7% of understanding is in the words that are spoken. 38% of understanding is the way that the words are said. 55% of understanding is in facial expression/body language. I was excited to realise that the reason my DO-SAY-SEE © model resonates and works so powerfully for our clients is that it is rooted in, and mirrors, human behaviour. Since pre-historic times, we have been wired to seek visual clues first to understand the world. Cavemen would look to the horizon to see if it was a predator approaching, or prey. They’d check the colour of a fruit first to see if it was good to eat or likely to make them ill.
All before they heard a roar or sampled the goods. You make a decision on whether you like someone in just a few seconds. Only then, might you make the effort to get to speak to them and get to know them better – and only then might you care to find out what they do. The same rules apply to your business. Do I like the look of your company? Does it communicate to me? (And, only then) Can you solve my problem? SEE, SAY and DO…in that order. Is it time to take a look at your branding? Discover more about your own DO-SAY-SEE. Contact InnerVisions ID for a free 30-minute brand consultation.